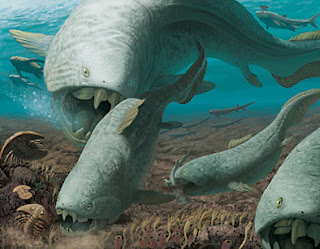 Life Before the Dinosaurs: Dunkleosteus. It ate everything from small fish to its own species. 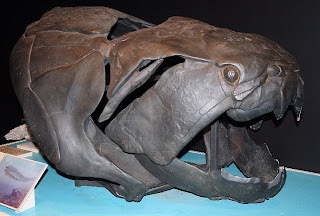 Like all placoderms, Dunkleosteus had its whole entire head covered in plates of armor. It had huge teeth that were probably somewhere around 3". Even its eyeballs were covered in armor. All that remains of Dunkleosteus is its head armor. 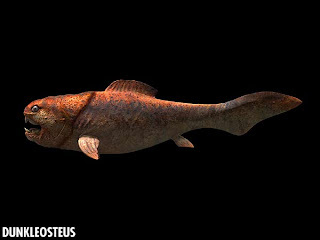 This is my favorite Devonian fish. My university has a skull from one of these things in its collection and I could probably fit inside it pretty easily if I curled up. I'm 38 years old, obsessed with all of the prehistoric world and I have to say I'm so impressed with you and your blog.You are one intelligent boy, you probably know more about this subject than I do.It's too bad that I do not know you in person as I'd love to talk to you about this subject.It is nice of your Mom to help you with the blog.Nice little project for you guys.Keep up the good work!I love your Dunk entry.I'm obsessed with dunks and megalodons.